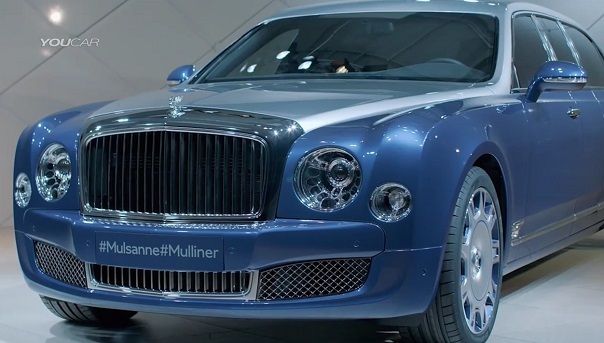 The updated sedan Bentley Mulsanne 2016 was shown on the network. British luxury car manufacturer Bentley prematurely presented an updated representation sedan Bentley Mulsanne. Moreover, Bentley showed just three updated versions: standard, Speed and Extended Wheelbase. From a technical perspective representation sedan Bentley Mulsanne received the following updates. car chassis was upgraded and got active engine mounts, a new air suspension, new steering system. The wheels are now shod with tires Dunlop, which produces half the noise in comparison with analogues. Motor updated sedan range consists of two versions of the 6.75-liter V8 Twin Turbo power 512 (1020 Nm) and 537 hp (1100 Nm), respectively. A more powerful version of the engine will be offered for the version of Bentley Mulsanne Speed sedan. With him it will accelerate from zero to hundred kilometers per hour of 4.9 seconds and the top speed will be 305 kilometers per hour. Together with the 6.75-liter engine will be offered 8-speed automatic ZF gearbox. The extended version of the executive sedan Bentley Mulsanne Extended Wheelbase is increased by 250 mm wheelbase, which is equal to 3516 millimeters. This gives the rear passengers there was a large space in front of his feet. Also, representatives of Bentley said that individual customers can order a version of the Bentley Mulsanne Grand Limousine by Mulliner, at which the rear of the passenger compartment will be 4 seats facing each other. Bentley Mulsanne Grand Limousine from tuning studio Mulliner is a six-limousine. At the Geneva International Motor Show competition limousine Mercedes-Maybach was special version Bentley Mulsanne Grand Limousine luxury of tuning studio Mulliner. Novelty increased by 1 meter wheelbase and four chairs, placed in front of each other in the rear. So, tuning studio has created a special version Mulliner Bentley Mulsanne Grand Limousine, which is characterized by an increased wheelbase. Interior of a luxury sedan was insert a length of 1 meter. As a result, the overall length of the limousine was 6500 millimeters. In addition, the height is 79 mm sedan was also increased. This is done in order to increase the space above the heads of the rear passengers. Opening the back door of the cabin, passengers will see the four seats that are placed in front of each other and are separated by huge arms with different systems of the car control buttons. In the near future there will be even more luxurious version of the limousine, in which only two seats will be located in the rear of the vehicle. I do not need to remind you that the interior trim spetsversii Bentley Mulsanne Grand Limousine is made of the most expensive in the world. In addition, the limousine was side electrochromic glazing, which can change the degree of transparency at the touch of a button. Tuning studio Mulliner will collect this special version only on request. Price Bentley Mulsanne Grand Limousine will be announced only potential buyer.